When planning your next getaway, consider bringing your bike. These modes of transportation allow bikes on board and generally free of charge. 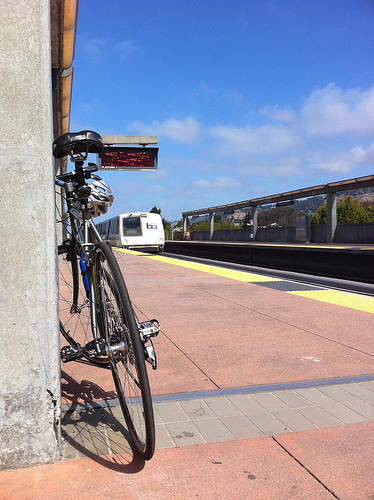 Restrictions: Bikes aren’t allowed on BART during peak hours in the Downtown Oakland stations. Regardless of the time of day, bikes aren’t allowed in the first three cars of the train. See website for specific peak hour restrictions. Gas powered bikes are not allowed. Cost: Fares depend on routes. No extra cost to bring a bike. Restrictions: Bikes must go in one of the two designated bike cars that are always the northern-most cars on the train. The car can carry 48-80 bikes depending on the type of car. Bikes must be marked with their destination and stacked in the order of their exit station. Only single-rider, two-wheel bikes are allowed. Cost: Fare is based on zone and distance of travel. No extra cost to bring a bike. Cost: Fare depends on route and ferry. No extra cost to bring a bike. Restrictions: Bikes are allowed on a first come, first serve basis. Maximum number of bikes allowed per ferry depends on the boat’s size. Electric bikes are not allowed. Restrictions: Each bus has a bike rack that holds two bikes and depending on how full the bus is, two more bikes will be allowed inside. Only single-rider, two-wheel bikes are allowed. Cost: Fares vary based on route but an all day pass is $6.00 for adults. No extra cost to bring a bike. Restrictions: Space on the rack is available on a first come, first serve basis. Bikes are only allowed inside bus between midnight and 5:30am if bike racks are full. Only single-rider, two-wheel bikes are allowed. Cost: $2.10 for adults, $.25 for a transfer. No extra cost to bring a bike. Restrictions: Allowed on all Capitol Corridor Trains and on two of the four San Joaquin trains. Must reserve a space on one of the train’s bike racks when making reservations as there is a limit of bikes per train depending on the route. Only single-rider, two-wheel bikes are allowed. Cost: $5-$10 depending on the route/distance in addition to the cost of your ticket. Restrictions: Historic streetcars, cable cars, and Muni Metro light rail vehicles do not have bike racks. Full size bikes are not allowed on these vehicles. Non-folding bikes are not allowed inside Muni buses. Only single-rider, folding bikes are allowed. Cost: $2 including free transfer. No extra cost to bring a bike.